The years-long drought in California has led to a steady uptick in the number, size and ferocity in wildfires in the state. 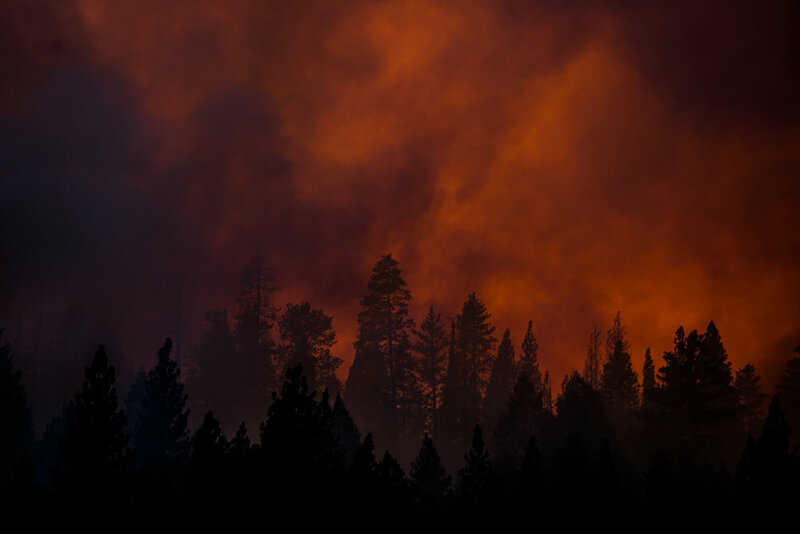 Wildfires are a natural phenomenon, but drought, climate change and decades of fire suppression led to more than 6,000 wildfires burning more than 300,000 acres in 2015 alone. The Antelope convict crew watch as the Butte Fire approaches their fire line near San Andreas, California, September 12, 2015. Antelope convict firefighters dig a fire line as the Butte Fire approaches near San Andreas, California, September 12, 2015. Los Angeles County firefighters hike in on a fire line on the Rim Fire near Groveland, California, August 22, 2013. The Rim Fire burned 257,314 acres and is the third largest wildfire in California history. Sunset on the Rim Fire near Buck Meadows, California, August 22, 2013. The Rim Fire burned 257,314 acres and is the third largest wildfire in California history. The remains of a forest burned by the Rim Fire just outside Yosemite National Park, California, August 24, 2013. The Rim Fire burned 257,314 acres and is the third largest wildfire in California history. Firefighters work to prevent the Rim Fire from jumping Highway 120 near Buck Meadows, California, August 24, 2013. The Rim Fire burned 257,314 acres and is the third largest wildfire in California history. The Rim Fire burns near Buck Meadows, California, August 24, 2013. The Rim Fire burned 257,314 acres and is the third largest wildfire in California history. The McCain inmate crew struggles to cut a fire line on a steep slope on the Rim Fire near Buck Meadows, California, August 24, 2013. The Rim Fire burned 257,314 acres and is the third largest wildfire in California history. Sacramento Metropolitan firefighter John Graf monitors the Rim Fire line near Camp Mather, California, August 26, 2013. The Rim Fire burned 257,314 acres and is the third largest wildfire in California history. A plane drops fire retardant on a vineyard while battling the Sand Fire near Plymouth, California, July 26, 2014. The Sand Fire destroyed 20 homes and burned more than 4,200 acres near the town of Plymouth. Firefighters protect an evacuated home while the Sand Fire burns behind it near Plymouth, California, July 26, 2014. The Sand Fire destroyed 20 homes and burned more than 4,200 acres near the town of Plymouth. A spotter plane flies past the Sand Fire as it burns near Plymouth, California, July 26, 2014. The Sand Fire destroyed 20 homes and burned more than 4,200 acres near the town of Plymouth. Firefighter Dave Beck rakes embers away from a road on the Rim Fire near Buck Meadows, California, August 22, 2013. The fire burned 257,314 acres in and around Yosemite National Park, and is the biggest wildfire on record in the Sierra Nevada. A firefighter battles a spot fire on the Rocky Fire in Lake County, California on July 30, 2015. As of August 5, the fire had consumed 69,600 acres and is one of 23 wildfires burning in California. A firefighter runs to move a truck before it's overrun by a spot fire on the Rocky Fire in Lake County, California on July 30, 2015. As of August 5, the fire had consumed 69,600 acres and is one of 23 wildfires burning in California. Firefighters dig a fire line around a spot fire on the Rocky Fire in Lake County, California on July 30, 2015. As of August 5, the fire had consumed 69,600 acres and is one of 23 wildfires burning in California. Firefighters watch the Rocky Fire advance in Lake County, California on July 30, 2015. As of August 5, the fire had consumed 69,600 acres and is one of 23 wildfires burning in California. We respect your privacy, which means we won't share or sell your information. All images and text © 2000-2019 Prime Collective and its respective photographers. All rights reserved. Permission to use content by written consent only.